I saw a billboard last week that read, "Unplug to Recharge." Sounds like an oxymoron... but it has validity and it's darned good advice! So with that, I took a few hours last weekend to step away from the computer and retreat to the sewing machine. 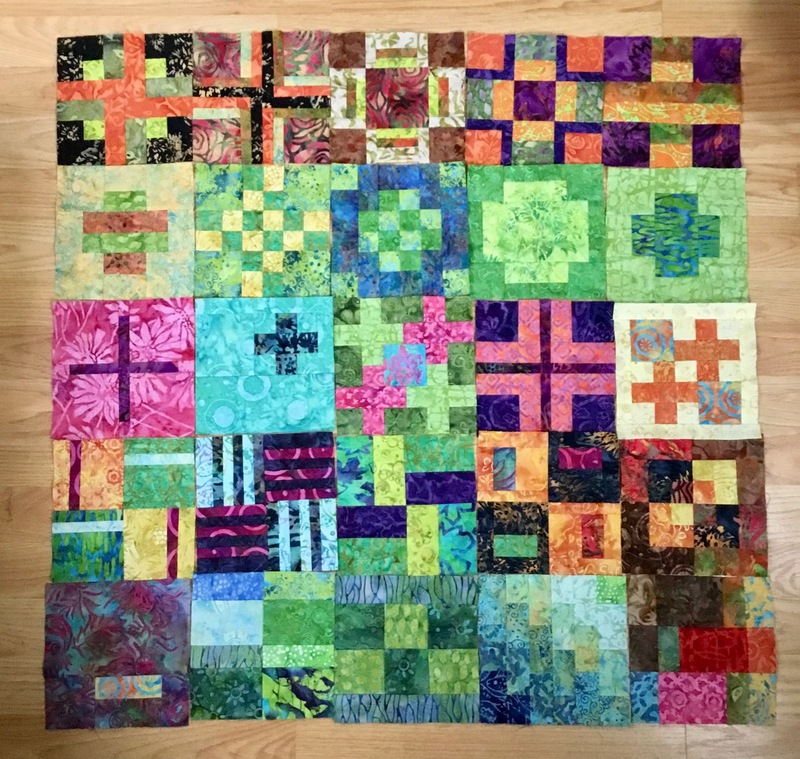 With 77 blocks complete, I’m 3/4 of the way to completing the City Sampler blocks from the book, "100 Modern Quilt Blocks." These are Blocks 1 through 25. Blocks 1-25. 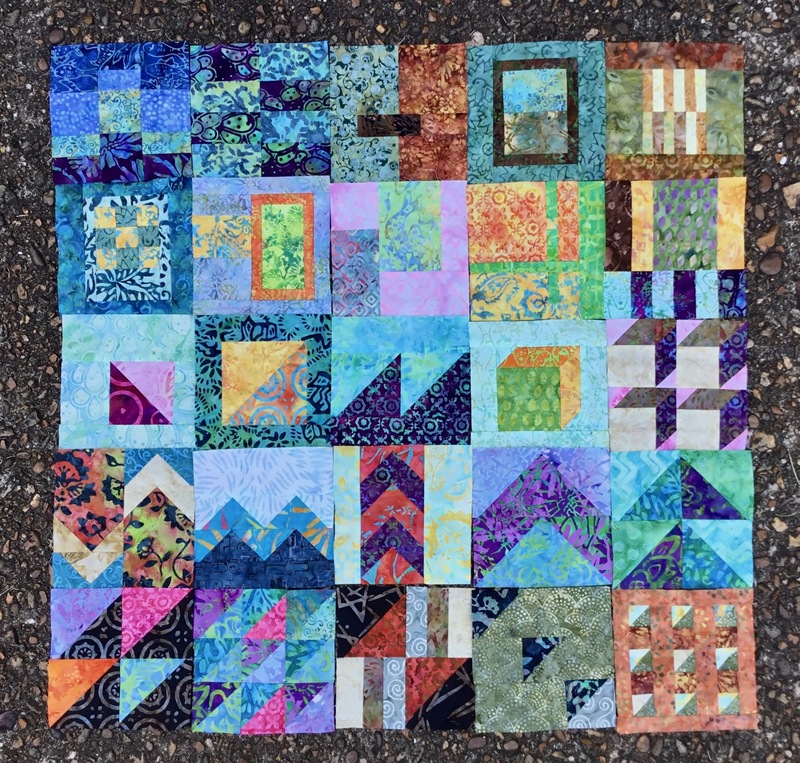 100 Modern Quilt Blocks City Sampler quilt. Blocks 26-50. 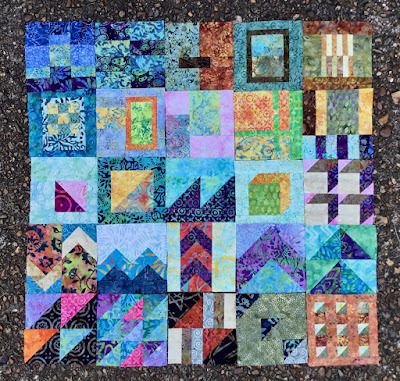 100 Modern Quilt Blocks City Sampler quilt. And Blocks 51 through 75. Blocks 51-75. 100 Modern Quilt Blocks City Sampler quilt. My stack of these 6-inch beauties is growing tall. It will be a fun exercise on the design wall once all 100 blocks are complete. 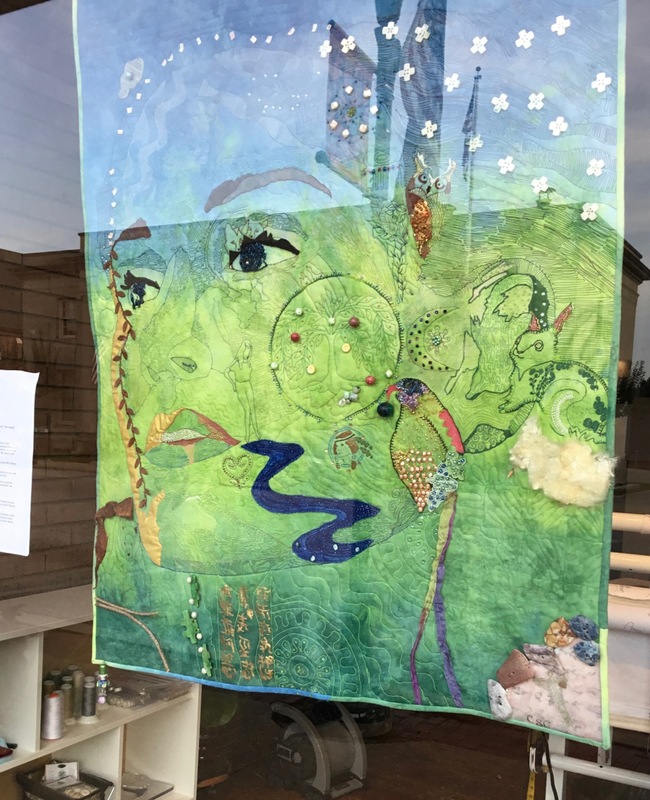 "Mother Earth: Her Face Evolving"
quilting at Birdsong Quilting, Embroidery and Crafts. There is a wonderful art quilt exhibit at Birdsong Quilting, Embroidery and Crafts, featuring the work of members of the Quilt Artists of Kentucky (QAK), an auxiliary group of the Kentucky Heritage Quilt Society. The exhibit has several pieces from "Space: The Final Frontier Challenge" and other art quilts by members of the group. While at the exhibit, I met Christine Schramm Cetrulo, a member of QAK. Christine was teaching a fabric painting class at Birdsong—introducing quilters and sewers to fun and exciting techniques for embellishing fabric. 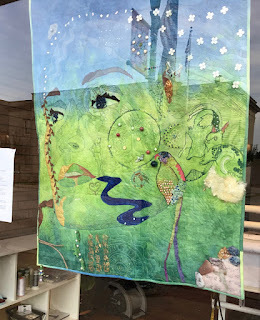 Here is one of Christine's quilts, "Mother Earth: Her Face Evolving" that is on display at the shop. Amazing work! 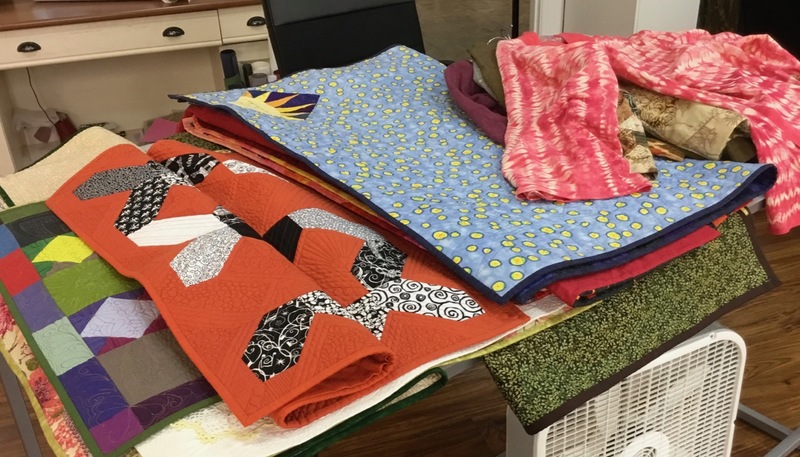 As part of the month-long celebration of quilting and quilt artistry at Birdsong Quilting, Shannon, the owner, asked if I would come and do a trunk show of my work. batiks from Majestic Batiks, and art panels from Frond Design Studios. I had a sampling of quilts, guild Challenges, art quilts, free-motion quilting and apparel (jackets, blouses, knit tops and pants). A few of the attendees said that this was their first trunk show so I hope they got a good dose of inspiration and a broad range of possibilities and ideas for new projects. My trunk show included examples of quilts and wearables. The dialog with the attendees at my trunk show was lively. Their questions were thoughtful and inquisitive. Questions spanned a range of topics including: free-motion quilting, the whats and whys of bobbin thread, quilt facings, sewing machine needles, yarn-dyed vs. printed cotton fabrics, patterns for garment sewing, and the different fabrics—knits, canvas, rayon, etc.—that are now available to quilt shops from fabric manufacturers of quilting cottons. 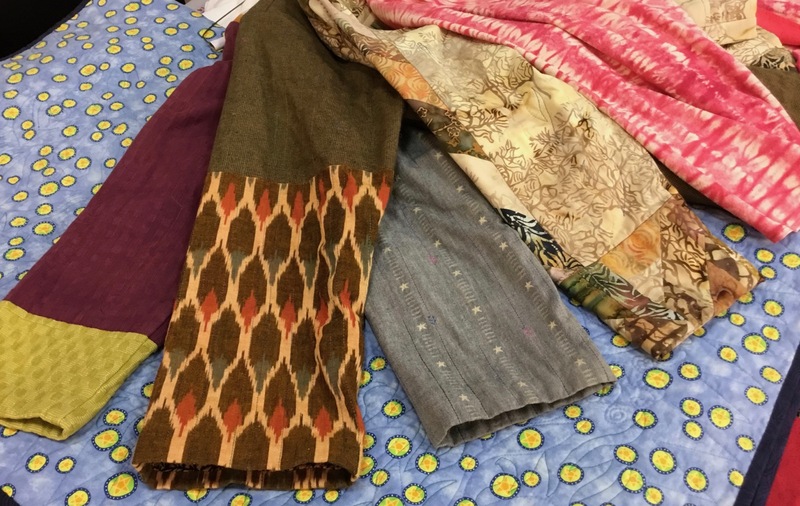 Birdsong Quilting has a great selection of fabrics for quilting as well as sewing. The store also offers classes and events to support these endeavors. Thank you to Shannon for the kind invitation and to the staff at Birdsong that helped with the set-up and logistics of the trunk show. If you are in Georgetown, KY (Lexington, KY area) in August, stop in to see the art quilt exhibit at Birdsong Quilting. 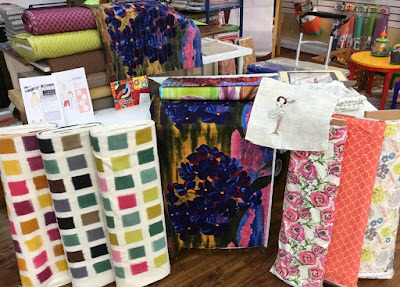 Shop Birdsong's wonderful selection of fabrics, notions, books and supplies and take your next quilting or sewing project to another level... or out of this world! There are a lot of stitch-alongs, sew-alongs, quilt-alongs (and knit-alongs, for that matter) available for makers. Some are hosted through local quilt shops, some through on-line sources. These programs help makers tackle a big project by breaking it down into smaller, more manageable bites. The latest program I've encountered is The Farmer's Wife. The Farmer's Wife Sew-along with Paper Pieces and Art Gallery Fabrics. Paper Pieces, a well-known creator of English Paper Piecing [EPP] products, has teamed up with Laurie Aaron Hird to re-create The Farmer's Wife sampler quilt using the English paper piecing technique. See the Say Hello to Farmer's Wife blog post for an introduction to the program. The Farmer's Wife English Paper Piecing kits and instruction book. 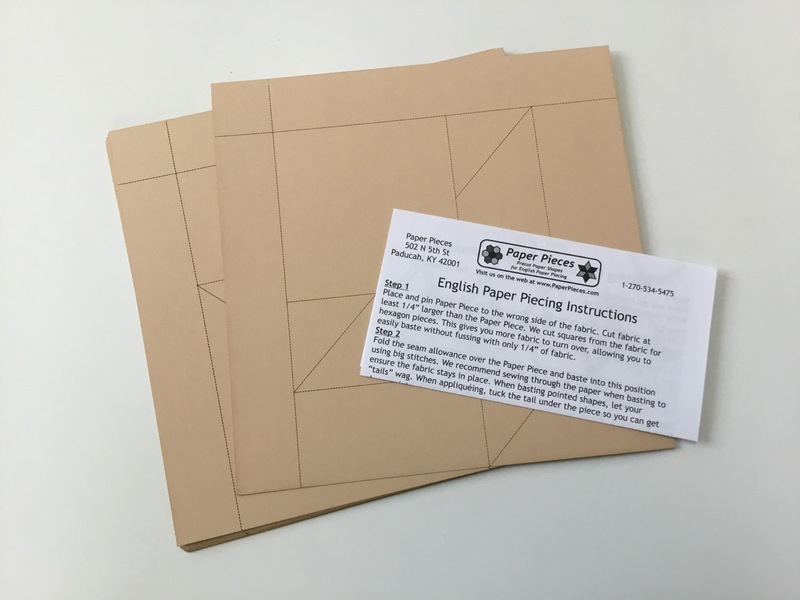 The EPP paper templates are perforated and come with pieces for the sashing and cornerstone. The blocks are 6 inches and the book is needed for assembly instructions. 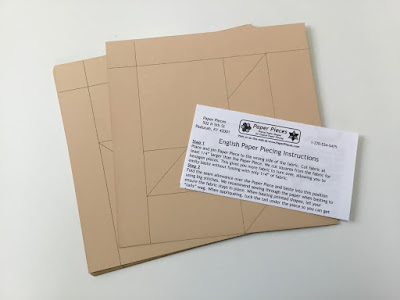 EPP paper templates include sashing and cornerstone templates. So when each block is complete, you can assemble as you go if you choose. Paper Pieces chose Art Gallery Fabrics Color Masters for a beautiful, 21st century colorwash version of a 1920s era sampler quilt. Color Masters by AGF come in 10-piece curated selections of either fat quarters or half-yard cuts. 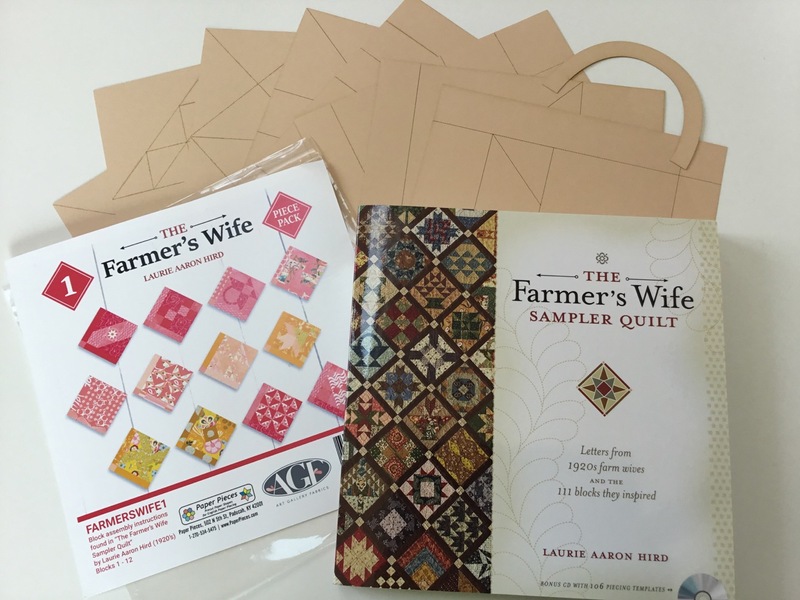 The Farmer's Wife sampler uses the fat quarter boxes (available through Paper Pieces or YLQS (your local quilt shop)). Paper Pieces has made it easy for the stitch-along participants by creating a color layout for the colorwash sampler. It's available on their website here. Looking for additional support, tips and stitching camaraderie? Angie Wilson of the GnomeAngel blog is hosting The Farmer's Wife Stitch-along. There is also a Facebook page and Instrgram hashtag, #FW1920EPPSAL, for your virtual Show and Tell and prize eligibility. The official launch date for The Farmer's Wife stitch-along is August 24. EPP kits and Color Masters fabrics are available now so you can get a jump on planning a beautiful colorwash sampler. I'm told there will be a break for Thanksgiving and December holidays, so don't panic. Are you in? EPP is portable, so you can take it with you and work on your blocks anywhere. You'll also enjoy reading the stories of the women across the country who were married to farmers in the 1920s. 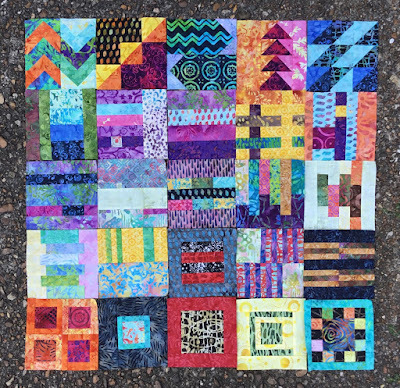 These are the first 25 blocks of the 100 blocks of the City Sampler quilt. This sew-along—hosted by GnomeAngel—started July 7 (see my blog post here) and we are a quarter of the way through it... making steady progress. Blocks 1 to 25 out of 100. I do keep ahead of the Instagram post dates. Blocks 1 through 39 are in this pile. Closeups of each of my blocks are on my Instagram feed at veronica.fiberantics. Blocks 1 through 39 for the City Sampler quilt. 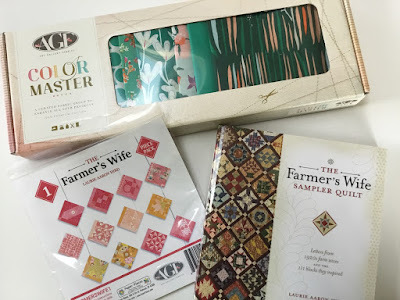 It's been a delight to experiment with the various designs and color combinations from Majestic Batiks that I'm using for this sampler challenge. 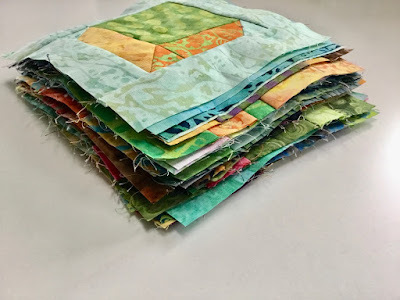 At first, I was following fabric and value placement shown in the required book, "100 Modern Quilt Blocks." Now, I come up with my own color and value placement and I'm finding this more interesting and engaging. It is a more mindful process for me. And because each block is a different pattern, I like the focus on making just a single block from that pattern.